NVMe (Non-Volatile Memory Express) from Supermicro is a scalable, high-performance CPU PCI-E Gen3 direct connect to NVMe devices, designed for Client and Enterprise server systems using SSDs technology, that was developed to reduce latency and provide faster CPU to data storage device performance. This means NVMe solutions can perform more work in less time, translating into lower costs and increased revenues. The ROI benefits for customers from NVMe enabled servers is immediate and substantial. 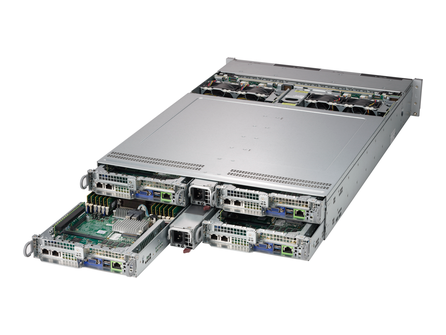 The Supermicro 1028U-TN10RT+ is a 1U SuperServer with 1000W redundant power, 10x 2.5" NVMe hot-swap bays and integrated dual 10GbE. The Supermicro 2029BT-HNTR SuperServer is a 2U Rackmount server with 6 2.5" Hot-swap Drive Bays, 4 Heavy duty 8cm PWM fans with air shroud, dedicated IPMI 2.0 LAN and 2200W Redundant PSU. The Supermicro 2029BT-HNC1R SuperServer is a 2U Rackmount server with 6 2.5" Hot-swap Drive Bays, SAS3 support via Broadcom, dedicated IPMI 2.0 LAN and 2200W Redundant PSU. 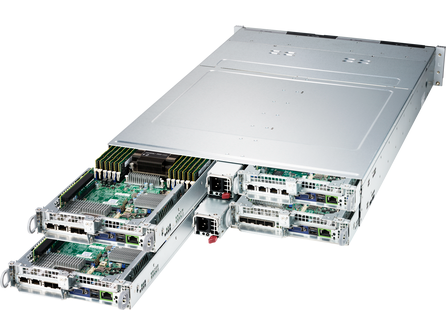 The Supermicro 2029BT-DNC0R is a 2U 2-node server with 2200W redundant PSU and support for dual Xeon UPI up to 10.4GT/s CPU, 24 DIMMs of memory and 8 Hot-swap 2.5" SAS3 drive bays. The Supermicro 2029BT-DNR is a 2U 2-node server with 2200W redundant PSU and support for dual Xeon UPI up to 10.4GT/s CPU, 24 DIMMs of memory and 12 Hot-swap 2.5" NVMe drive bays. 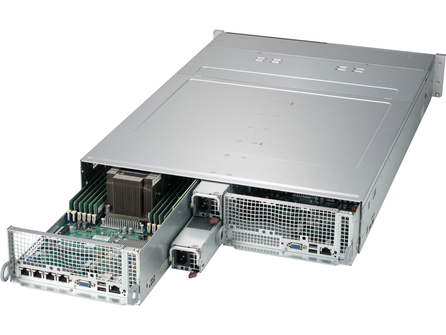 The Supermicro 2029BT-HTR is a 2U 4-node server with 2200W redundant PSU and support for dual Xeon UPI up to 10.4GT/s CPU, 24 DIMMs of memory and 6 Hot-swap 2.5" SATA3 drive bays. 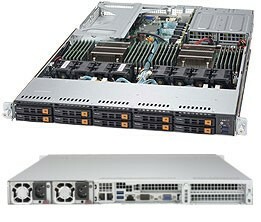 The Supermicro 2029BT-HNC0R is a 2U 4-node server with 2200W redundant PSU and support for dual Xeon UPI up to 10.4GT/s CPU, 24 DIMMs of memory and 6 Hot-swap 2.5" SAS3 drive bays. 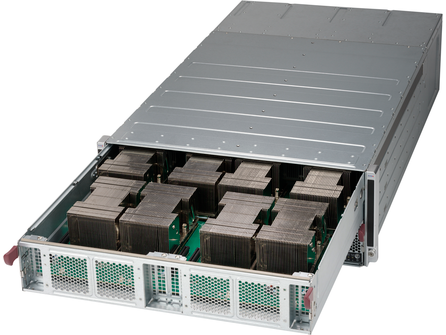 The Supermicro 2029BT-HNR is a 2U 4-node server with 2200W redundant PSU and support for dual Xeon UPI up to 10.4GT/s CPU, 24 DIMMs of memory and 6 Hot-swap 2.5" NVMe drive bays.